Oleksiy Kolomoiets and Igor Sayenko, Kyiv Classic Accordion Duo from Ukraine, return to St Modoc’s Church in Doune to thrill again with classical pieces and Russian and Ukrainian music. Come and enjoy their performance at 7.30pm in St Modoc’s Church Doune Refreshments provided at the interval £10 adults £5 concessions Tickets available on the door or from Philip Gaskell 07980749972 For the last 10 years, the duo have toured the UK in time out from their orchestras raising much needed funds for the Hippokrat charity based in Chernigov, Northern Ukraine. Hippokrat provides support and services for now young adults disabled by Chernobyl fall-out when their mothers were pregnant. This Sunday we are joined by the Manchester Church Lads and Gilrs Brigade for the Annual Camp Service. This year a record number of young people are staying at Dounans. This will be held on Monday 31st July with the destination being Callander House Falkirk. Callendar House dates from the 14th century but was rebuilt in the 19th in French chateau style fused with Scots Baronial. It is set in the nationally important historic designed landscape of Callendar Park, which contains a section of the Antonine Wall World Heritage Site. The estate was originally one of the seats of the Thanes of Callander (note spelling) who also had a castle close to St Kessog’s Manse by the river Teith in our Callander. The House’s permanent displays are ‘The Story of Callendar House (from the 11th to the 19th century)’, ‘ The Antonine Wall: Rome’s Northern Frontier’ and ‘Falkirk: Crucible of Revolution 1750-1850’ . When we visit there will be a temporary exhibition on the Romans and one called ‘Workhorse: the Clydesdales of Flanders Moss’ of photographs by Michael Prince. In the restored 1825 Kitchen, costumed interpreters create an exciting interactive experience with samples of early 19th century food and stories of working life in a large household. There is a tea room and all floors are accessible by lift. Or contact Richard for further details. This entry was posted in Rector's Bulletin on July 24, 2017 by Stmary. This will be held on Monday 31st July with the destination being Callendar House Falkirk. Callendar House dates from the 14th century but was rebuilt in the 19th in French chateau style fused with Scots Baronial. It is set in the nationally important historic designed landscape of Callendar Park, which contains a section of the Antonine Wall World Heritage Site. The estate was originally one of the seats of the Thanes of Callendar (note spelling) who also had a castle close to St Kessog’s Manse by the river Teith in our Callander. Our nation at this time of uncertainty and tragedy. This entry was posted in Rector's Bulletin on July 17, 2017 by Stmary. This will be held on Monday 31st July with the destination being Callander House Falkirk. Callander House dates from the 14th century but was rebuilt in the 19th in French chateau style fused with Scots Baronial. It is set in the nationally important historic designed landscape of Callander Park, which contains a section of the Antonine Wall World Heritage Site. The estate was originally one of the seats of the Thanes of Callander (note spelling) who also had a castle close to St Kessog’s Manse by the river Teith in our Callander. The House’s permanent displays are ‘The Story of Callander House (from the 11th to the 19th century)’, ‘ The Antonine Wall: Rome’s Northern Frontier’ and ‘Falkirk: Crucible of Revolution 1750-1850’ . When we visit there will be a temporary exhibition on the Romans and one called ‘Workhorse: the Clydesdales of Flanders Moss’ of photographs by Michael Prince. This entry was posted in Rector's Bulletin on July 11, 2017 by Stmary. 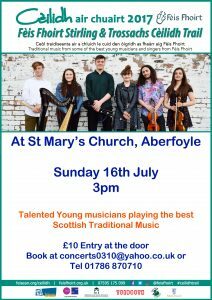 The Féis Fhoirt Céilidh Trail is an annual project that allows young musicians to tour the Stirling, Falkirk and Loch Lomond and Trossachs National Park area throughout the summer. The 2017 Ceilidh Trail already have a wealth of experience, with past and present members from The National Centre of Excellence in Traditional Music, City of Edinburgh Music School, Douglas Academy, University of the Highlands and Islands and have individually toured across the UK and Europe. This entry was posted in Concerts & Events on July 2, 2017 by Stmary.